How would you spend $1,000? | Center for Family Services, Inc.
What would you do with $1000? Depending on how you spend it, it could disappear rather quickly or last a while. That was the task I set upon myself when approached by our local Meadville WalMart to apply for their community grant. The WalMart Foundation has several focus areas, one of which is Hunger Relief and Healthy Eating. The question I asked myself was “Do I ask for $1000 worth of tuna?” or could we be more creative in our proposal. Hunger relief, well we do that well. We have our seven Crawford County Food Pantries providing non-perishables, like canned food and pastas, mixed in with fresh or frozen, meats and produce. Local businesses including, Sheetz, WalMart, Giant Eagle, Sperry Egg Farm and Red Lobster donate a variety of fresh and prepared foods to make the boxes we give out more like a trip to the grocery store than to a Food Pantry. The Healthy Eating part can be difficult when fresh produce donations are limited and some of the food items are processed. I met with a couple of staff and we tossed around some ideas. Planting a garden would give us fresh produce, but where and who would take care of the plants? Then I remembered that Women’s Services, Inc. started a community garden last year. Could we maximize their garden? Would they like the idea of partnering? Their community garden serves a few of purposes. First of all, it helps give fresh produce to the shelter clients. (WSI provides services to victims of domestic violence and a shelter for women and children in Meadville). Next, the garden gives their clients something to do. Gardening is good therapy. Don’t believe me? Try going out and weeding when you are having a stressful day, it’s therapeutic to get a little dirt under your nails. Finally, the idea of a community garden is to, yes, build community. People get to know their neighbors as they gather at the garden. When you know your neighbor a child may be more willing to tell you if they are being abused. The same goes for support for any victim of domestic abuse. Neighbors, who know each, tend to care about each other. Hey, selfies are the in thing! 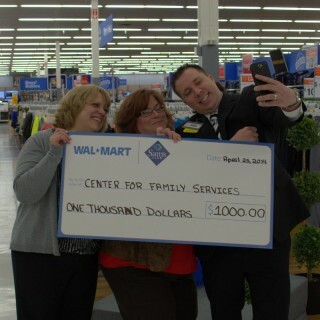 Meadville WalMart manager Adam Montayne and Personnel manager Rhonda posed for this fun shot. Good people at WalMart! Sounds like something to support, don’t you think? So do we. Since we are already looking to partner, why not ask some more community members to join the garden party? We met up with the Master Gardeners of Crawford County and took a tour of the Women’s Services property. We decided that there was plenty of potential to grow “vertically”. Bruce Harlan and Julie Hunter of Women’s Services loved the idea as well. We (CFS) would write a proposal to the WalMart Foundation for the supplies to build more garden space. Women’s Services, Inc. would provide the “garden” and people power to tend the garden and gather our harvest. The Master Gardeners would help in the planning and provide some seeds and starter plants, also with some help from an Allegheny College student. It seems that the good people at our Meadville WalMart thought this was a great idea, too. We received a check for $1000 to “plant the seeds” of our project, figuratively and literally. Just like any garden, their initial donation will continue to grow. We will nurture our partnerships, add some fertilizer to our community’s awareness and provide fresh produce each summer to families in need. I am excited to share the success of this project as it progresses. 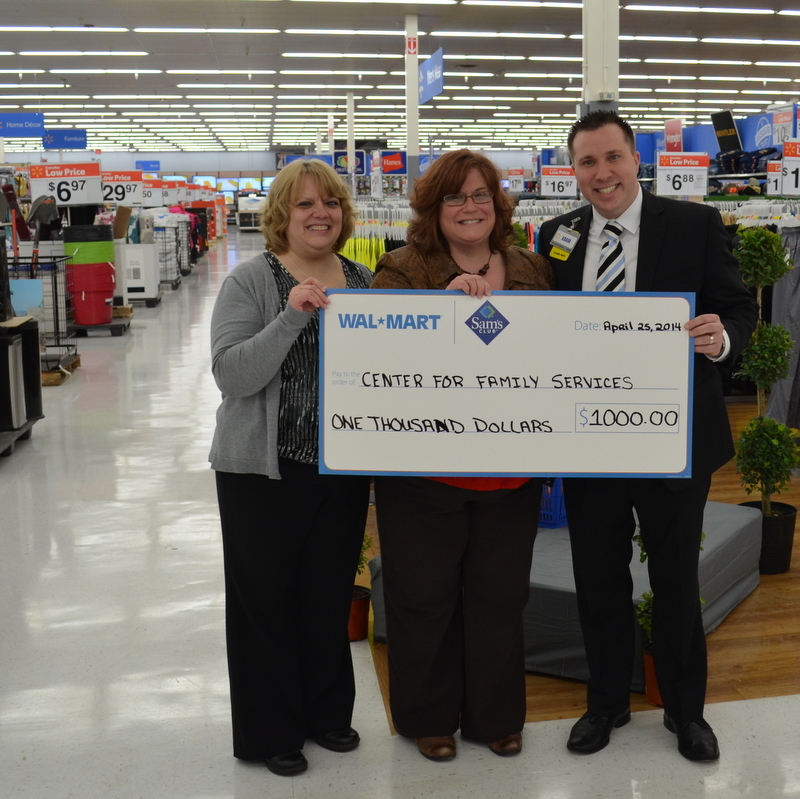 Thank you WalMart, Women’s Services and the Master Gardeners for turning an idea into a blossoming reality. Interested in being a part of this project? Contact us.